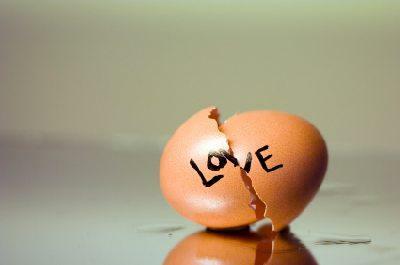 Love Break-up!!! Because of Savings!!! Are you saving to buy a new home? Naveen and Neha are a perfect match and an understanding couple. Naveen has a plan for everything in life. Neha is a cheerful and practical woman. Both of them discuss and get things done. So what made their ways apart? I should tell this. Neha wants to visit a good restaurant and have great food. Naveen says ‘no’. Neha wants to get away from her daily schedule and go for a vacation. Naveen says ‘no’. Neha’s birthday time! !, Naveen got a card for her. She is happy, he had given her a card atleast. Naveen now opens up. He has a dream house and he wants to buy it. So what is he doing? Yes. Saving saving saving. Saving, forgoing the comforts and the feel good factors too?? Yes. He wants to save not just for the down payment of the home, but for the whole value of the property. So how does he save? His dream home value : Rs. 40 lakhs. No. of years he should save : 14 years. In the mean time the property’s value increases which means he has to save even he reaches his limit. Ofcourse, his salary increases and he can save more. If you observe in the example, he saves more than half of his salary. Without even fulfilling smallest of his desires. When will he explore life if not at the age of 20s and 30s. So, Neha asks him to go for a home loan. He rejects. She tries to explain. So, is it that you should not go for saving at all if you buy a home? No, save for the down payment and for the rest go for a home loan. Let’s see how it works with a homeloan. Now, at the age of 28 years, he is enjoying in his own dream home. Since, EMI is fixed, he need not think of saving for a home when his salary increases. He can invest and diversify his extra income, where he gets more returns. Is that the end? 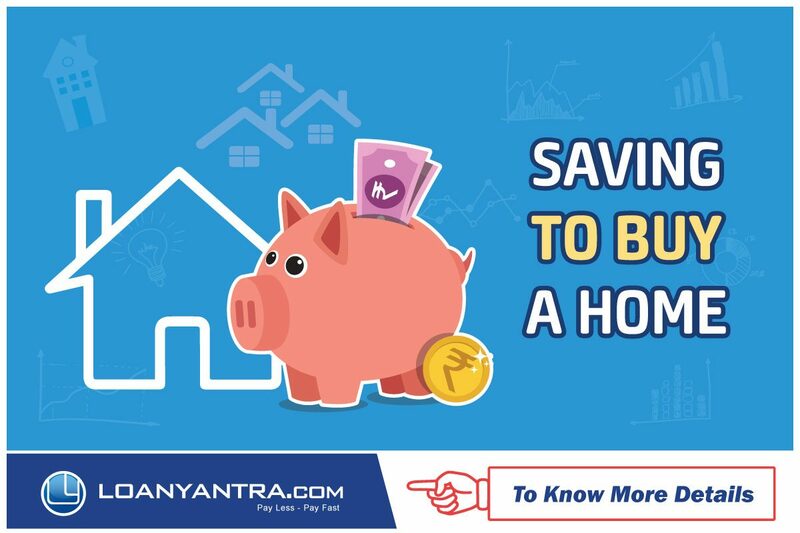 No, you rather have to, monitor your homeloan via loanyantra, the synonym for loan management services. This helps you to put an end to your home loan faster. Author keerthiPosted on August 13, 2018 August 13, 2018 Format ImageCategories Home Loan, Hot Tips, Illustration on saving, Property buying tipsTags homeloan saving, Tips, with and without homeloan example1 Comment on Love Break-up!!! Because of Savings!!! Are you saving to buy a new home? If you have been looking into the market of home loan, you might have come across the term ‘property tax’ more than once. Though property tax varies from state to state and depends on the valuation of your home, you must remember that your home loan depends on the property tax. Each home loan has the provision that in case you fail to pay off the property tax in an “event of default”, the lender could even foreclose on your property even when all your mortgage payments have been done in a punctual manner. 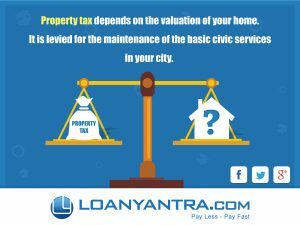 Why should you concern yourself with property tax? In India, property is a source of income for many and hence, it was only but natural that tax would be levied on any property you purchase, be it a humble shop or godown, flat or a proper residential building, provided you are using it to earn money in any form. The amount of property tax that you need to pay would depend on the value of the property that is being taxed in the first place. Why is the property tax being charged at all? The fact that the local municipal authority is the force behind the property tax being levied must tell you a lot about how the money you pay goes to towards the maintenance of the basic civic services in your city. The property tax in India is only charged on the real estate building and not on the plots of land, which don’t have any establishment in its vicinity. How is the property tax calculated? What is Annual Value? The property tax you need to pay is decided on the basis of the annual value of the let out or self occupied property. For the self occupied properties, the annual value is taken to be zero. However, if that property is rented, the property tax is calculated accordingly. What are the tax benefits of your home loan?  Under Section 24, you are empowered to claim up to Rs 200000 or the actual amount of repaid interest. However, you can only make the claim when you are in possession of the house.  Under Section 80C, you can claim the principal up to the maximum limit of Rs 150000 across all the investments made under the section 80C. However, you might be needed to show the lender’s statement showing the not only the interest and principal components but also the repayment for the year. How can a new homeowner avoid property tax traps? Every homeowner should go to the pains of confirming the tax rate before signing on the dotted line to save himself from the reassessment and hikes of rate of interest. The estimate of a real estate broker of the approximate tax bill might prove to be helpful but even then you might be required to pay more tax in the subsequent years. You can potentially open up an escrow account in order to set apart the funds that would be drained to provide for the taxes. Second Home – A Relaxing Option? With increasing affluence on the one hand and a growing realization that there is a need for a relaxed lifestyle at least on weekends, the concept of second homes appears to be gaining popularity. According to the National Council of Applied Economic Re­search, the number of households de­scribed as rich is expected to reach 11 million by 2013 from 3 million in 2003. Meanwhile, the number of mid­dle class aspirers is predicted to leap even more dramatically, from 46 mil­lion to 124 million. The number of HNW Is in India is growing at 20% YoY, second only to Singapore. This growing opulence of Indians surely makes the second-home mar­ket pretty hot. According to a study conducted by Kapston.com, a Banga­lore-based E-business consulting firm, second-home sales in India in­creased by 50% from 2002 to 2007. The trend slowed a bit in 2008, most­ly due to the economic woes of the US. Then it picked up in mid-2010 to slow down slightly only in the recent time, although now it’s a normal, reg­ulated market where good stuff sells very quickly. Different people invest in a secondproperty with different motives. For some, second home is to have a re­laxing place away from the hustle and bustle of city life, extreme heat and the stresses of work. There are many who’d like to have a second home to spend the rest of their lives in, post-retirement. Others invest in a second home in order to earn rental income. The primary reason for buying a second home is still lifestyle among Indians; however people have start­ed realizing the investment potential, but the investment consideration comes in a strong second place. Even if buying a second home in­volves spending a lot more money be­fore retirement, you will be wise to consider it as an investment. If, for ex­ample, you buy a second home five years before you retire, you will be able to earn money by renting out your property for the next five years, and cover a part of the mort­gage costs. And it’s not only for Indian dwellers. 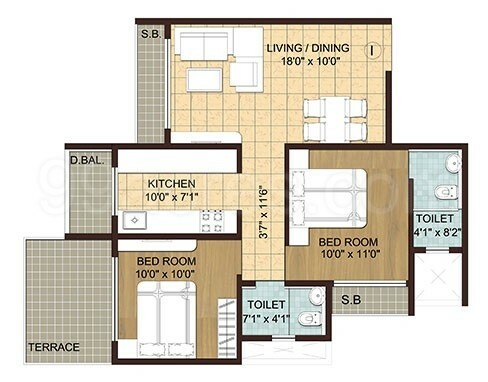 Non-resident Indians are buying this mid-level housing as well. NRIs can easily attain housing in In­dia because they were born there— but they can also buy even if their parents or grandparents were born there. Many NRIs choose to go back to where they came from; they have dreams of having India as a possible place to retire, where hired maid ser­vants will run their day-to-day tasks while they relax close to friends and family. The home towns where they grew up always have a certain draw on their heart strings. A second home is not a bad idea. It can serve the purpose of a change from the routine, once in a while, and leave you refreshed and energized. It can also be a wise investment. In fact people in the higher income brackets even opt for more than one second home as part of their long term in­vestment strategy. 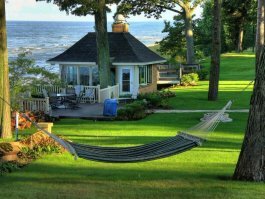 Author keerthiPosted on November 21, 2015 March 1, 2016 Categories Home Loan, House sale, Property buying tips, Tax BenefitsTags luxury, relax, second homeLeave a comment on Second Home – A Relaxing Option? Everyone knows that buying your first home is an expensive ordeal—just the cost of a down payment alone can be significant for many buyers. But those aren’t the only costs that you have to consider prior to home shopping. First-time buyers often don’t realize that they will need to pay for more than just the selling price that they negotiate with a seller. Things like interiors, hookup fees for utilities, and appliances are all extra expenses which add to the hidden costs of buying a home. So what else do you need to budget for as a first-time buyer? Follow along as we take you through the basics. Though mentioned in the cost sheet by the seller. Take care that you are in the safe side wuith the legal charges. If you are buying a house using a real estate agent, make sure that you have your terms discussed in detail before proceeding further. Usually it is 1% – 2% of the property cost. However, the agent is paid a percentage of the sale price upon the completion of the transaction. The trend now in India with the sellers is, they mention the cost for the government approval in the price sheet. 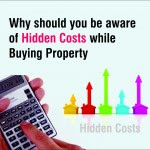 So be clever and conscious when you calculate the cost of the property. Please do research on the present trend and compare in your price sheet. Note : Feel free to visit our website (www.loanyantra.com) for constant alerts on interest rate changes and also for zero fee balance transfer. We all know that interior designing and buying utilities are going to cost money; that is inevitable. Interior designers will surely cost your pocket. So depending on your financial situation, take a call. There are plenty of options around. Probably, it is time for you now to look up for offers and sale. Now-a-days, shopping online and cash on delivery options make things easier and economical as well. So think wise before you shop either online or outdoor. The idea is to save money and time too. Property taxes are something that every homeowner has to pay, and they vary by location. And this is one of the taxes the government is strictly probing. So to avoid paying lump-sum, plan well in advance. Your first grocery trip is going to be expensive. Why? Because, chances are you need to stock up on groceries, spices, canned goods, and other staples. Don’t worry, you’ll only need to do a move-in shop once. The rest of the time you’ll just buy what you need, when you need it. Thinking of financing your first home? Know these things! From down payments, to mortgage brokers and traditional lenders such as banks, we’ll explore what options are best for financing your first home. Flexibility for a typical borrowers. Note : Our (loanyantra.com) customers can always find us as a reliable source in managing the home loan as we suggest you the best home loan option that suits your financial situation, and always alert you with the changes in interest rates. 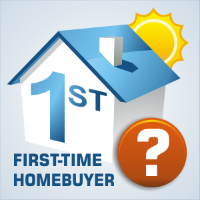 Author keerthiPosted on November 18, 2015 January 23, 2017 Categories Property buying tipsTags First time home buyer.Leave a comment on Thinking of financing your first home? Know these things!